Composer-conductor-arranger-pianist Marvin Hamlisch was a multi-hyphenate. He also was an early EGOT winner (back when it was more difficult to accomplish this feat because there were fewer categories in all four awards). 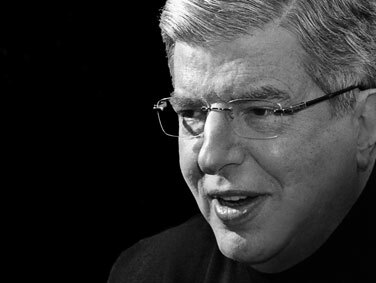 Hamlisch visited Little Rock numerous times throughout his careers. In 1996, he performed at Wildwood Park during the first season of the Lucy Lockett Cabe Festival Theatre. He soloed with the Arkansas Symphony Orchestra in January 2000 performing many of his works for film and a few for stage. In 2006, he returned to the ASO to perform with Robert Klein and Lucie Arnaz and the latter duo recreated their roles from the Hamlisch-Neil Simon-Carole Bayer Sager musical They’re Playing Our Song. His final visit to Little Rock was in 2011. He was performing in Conway but shopped in Little Rock for clothes when his luggage stayed in Chicago. Over his career, Hamlisch was nominated for twelve Oscars. He won three at the 1974 ceremony. They were Best Song for “The Way We Were” from the film of the same name (shared with Alan and Marilyn Bergman), Best Score for The Way We Were and Best Adaptation Score for The Sting. The latter heavily featured music by former Little Rock resident Scott Joplin. As noted earlier on the blog, even before the February 1940 opening of the music hall, the lover level exhibition hall was playing host to events including basketball games. By 1945, things were well underway on both levels. Buddy Johnson & his Orchestra were playing a dance for African Americans in the lower level on January 10. Upstairs events ranged from a lecture on Christian Science (January 7), a play Good Night Ladies (January 17), a lecture by Dr. Emil Ludwig on Germany after World War II, and Paul Draper & Larry Adler in concert (January 23). In 1950, Tallulah Bankhead starred in a revival of Private Lives (January 13), a Passion Play booked it for over a week (January 21 – 28) and a double-header of Shakespeare plays held court on January 30. Margaret Webster’s Shakespeare Company played The Taming of the Shrew in the afternoon and Julius Caesar in the evening. Also that month the Arkansas State Symphony (a forerunner to today’s Arkansas Symphony Orchestra) gave a concert on the 17th. A highlight of 1955 was a women’s wrestling match on January 4 in the lower level. In 1960, two theatrical productions were presented. On January 8 & 9, Odd Man In was presented “pre-Broadway” (it didn’t make it). Much more successful was the national tour of My Fair Lady from January 18 through 23. 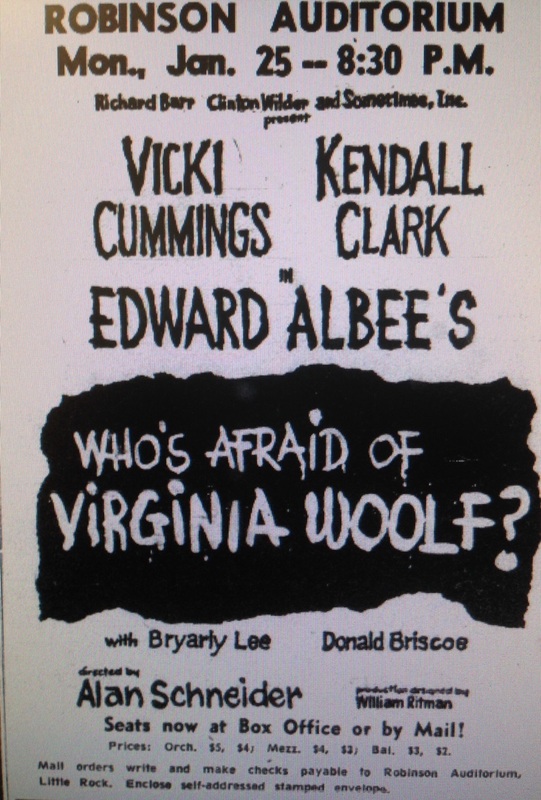 Though Little Rock native Ben Piazza had helped develop the play, he wasn’t in the cast when the national tour of Who’s Afraid of Virginia Woolf? played Robinson on Januayr 25, 1965. By the late 1960s and early 1970s, Robinson was at a crossroads. Many performers wanted to play at larger spaces (such as Barton Coliseum) or smaller venues (such as churches or the UALR recital hall). In 1970, the Happy Goodman Family gave a concert on January 21. Five years later they returned on January 10, 1975 in a concert with Vestel Goodman. The next night, Johnny Paycheck was in concert. On January 21, 1975, Robert Alda headlined a tour of The Sunshine Boys. Orchestra concerts dominated most January offerings from 1980 onward. On January 27, 1980, the Pittsburgh Symphony Orchestra gave a concert at Robinson. In 1985, the Arkansas Symphony Orchestra presented concerts (January 19 & 20) with Misha Dichter, pianist. January 1990 saw the ASO with Stephen Burns, trumpet on January 20 & 21. In 1995, the ASO performed Rimsky-Korskaov’s Scheherazade on January 13 & 14. Composer, pianist and conductor Marvin Hamlisch highlighted a concert with the ASO on January 22 in 2000. Earlier in the month the ASO performed Der Freischatz on the 15 & 16th. The day before Hamlisch, the Martins were in concert. 2005 highlights included the ASO with Elmer Oliveira, violinist (Jan 15 & 16), the ASO Side by Side concert (where Arkansas Symphony Youth Orchestra musicians and ASO musicians perform together) on January 29 and the ASO Family Series: Secrets of the Orchestra on January 30. The Irish dance spectacular Riverdance played Robinson from January 17 through 19. Five years ago, Ron “Tater Salad” White performed his stand-up at Robinson on January 8, 2010. Later that month the ASO offered Edvard Grieg’s Piano Concerto on January 16 & 17. The 2010 ASO Side by Side concert was on January 30. On January 20 the Shen Yun Chinese cultural performance took place in Robinson. Little Rock connection: Appeared with the Arkansas Symphony Orchestra at Robinson Center Music Hall. One of his appearances was conducting a concert version of the Tony nominated musical They’re Playing Our Song. 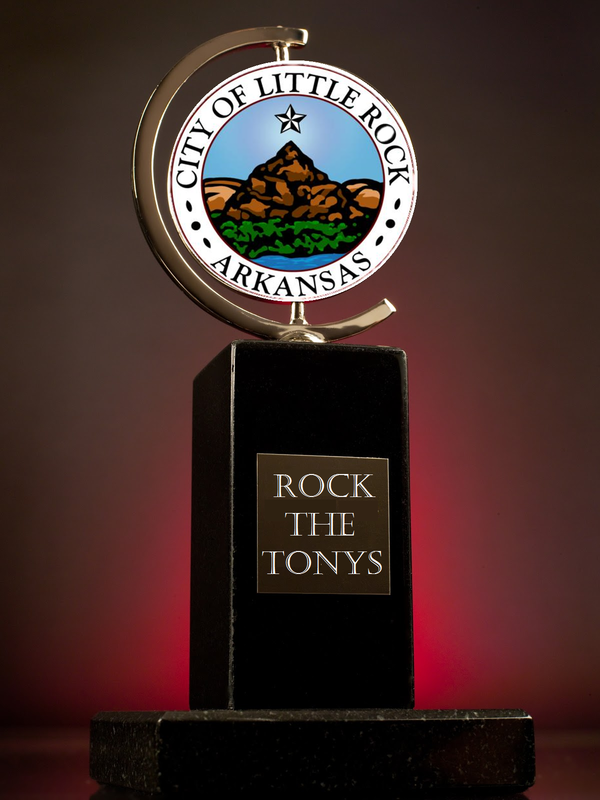 Tony Awards connection: Won a Tony Award for composing A Chorus Line. Also nominated for Sweet Smell of Success. Appeared as a presenter at the 1982, 1993, 2002 and 2007 Tony ceremonies.